Just a note, your delivery man was on time. The garage is level and all the doors work really nice. 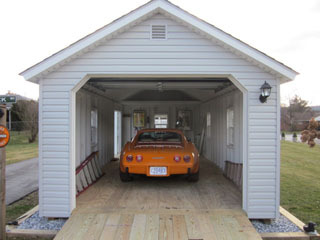 He put the garage exactly where I wanted it the first time, with no adjustments, very professional job! I would recommend Twin Locust to anyone. Thanks very much for a quality built garage. Just a quick word on what a great job your crew did today. It was amazing to watch the great skill and precision that Wayne and company demonstrated getting the shed down our driveway. Incredible job. The retaining wall and stone pad was installed beautifully and the shed placed with precision. 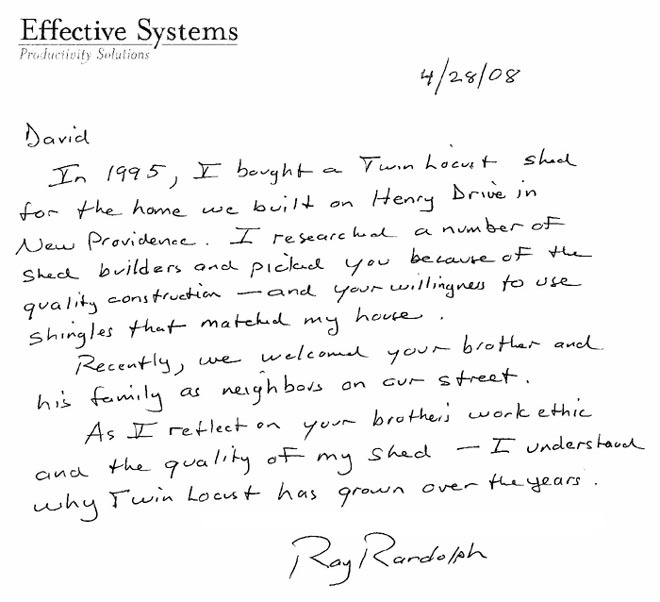 We will let friends and family know what a great experience we have had with Twin Locust and how impressed we are with the quality of your product. Hi Dave, I just wanted you to know that everything went great! 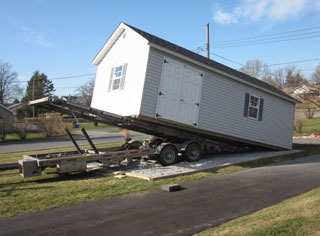 I was really impressed by Wayne & Steve's professionalism throughout this whole shed delivery process. If they were in the olympics for such an event, they would by far definately be taking home the gold. They were able to put the shed right were we wanted it and such was not an easy task. They did so most impressively with the expertise and precision of a drill team and in a manner of utmost professionalism that seems to be a lost art nowadays. Understandably, we cannot Thank Everyone there enough for such a pleasurable shed purchasing experience. With everyone from John whom made this purchase possible for us and You whom worked the logistics of getting it to us, especially with so many rain issues. And then finally, with Wayne & Steve on site whom were able to place it right were we wanted with no damage to our yard. Your entire company and its staff has trully raised the bar on so many levels of professionalism in regards to purcahsing sheds that I don't see how any other company could even come close. Please know that this is something that we will most definately share with many in our travels. We have alrready since shared our great experiences with many others and I know for a fact that several will most likely be purchasing sheds from you in the very near future. If not before winter, definately come spring. If you would be so kind as to please share our accolades and praise to everyone such would be most appreciated. In closing, please know that we will aways keep you in mind for our future shed purchases and share with others our great experience whenever we may hear of individuals looking for shed. Thank You ALL Again for Everything. Have A Safe and Enjoyable Holiday Season. Hi, he was great (delivery driver), hard area to get into definitely an asset to you. Very courteous ..knows his job....love it perfect thank you very much. 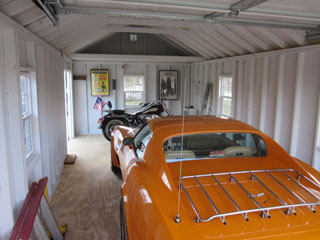 My Twin Locust Barns garage is great across the board - it looks fantastic, it's well-built, and is an outstanding value. Delivery was timely and flawless. These guys are true professionals. 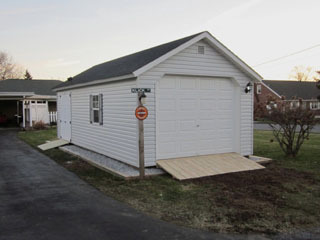 My neighbors in Hershey love it and it looks much better than many stick-built garages in the area. 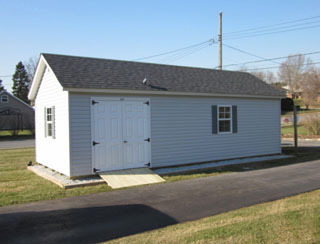 Pete: My wife and I would like to thank you for your assistance in getting our new storage shed. It was delivered last Tuesday, and it is exactly what Cindy wanted. Thanks again for helping us get our garage cleaned out so Cindy can park her car in it. I recently purchased a Little Barn from your company and I feel compelled to let you know what a pleasure it was to do business with Twin Locust Barns Inc., in particular, your sales representative, Jim. I received the shed yesterday and everything looks just like I thought it would. I can't say enough about the guy who delivered it and set it up. He was on time, very conscientious and did a great job with putting it exactly where I needed it to be. It's not too often things work out just right when communicating over the phone and internet. Thanks for a great shed buying experience, I'll recommend you guys to anyone. Just a note to say thanks again for the wonderful shed we recieved from Twinlocust Barns. It has been a few years now and the shed is still in excellent condition and keeps our items dry. The shed is awesome, the price is right and the workmanship is second to no one. You folks are the best! You've been wonderful from the beginning - our shed is so incredible. You really did a custom A+ job! You will be HIGHLY recommended by us. I was so disappointed when I realized I couldn't be here when it was delivered. 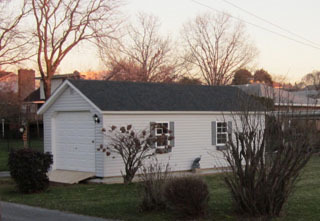 When I came home it looked like an addition was put on the house. Thank you for your quality - no, HIGH quality workmanship and friendly service. Have a Blessed Christmas + A wonderful New Year. Thank You! A note to Twin Locust Barns working with Pack 101...We have shopped for a shed endlessly for the last month. After looking at many different types and manufacturers we ended up right here in our back yard with the best-built shed/barn we could find. Quality and price is what we were looking for and Twin Locust Barns was the one that delivered more so than any other. Hats off to Owner, Dave Petersheim for a job well done. Special thanks to Jerry Waterson for helping out. I would like to thank you for the shed that you built and sent down here for Katrina Relief. I found your address and fax number in a 2006 Lancaster Business directory. I am glad that you put the "Twin Locust" plate above the door. I am sorry it took so long to get in touch with you, I am truly grateful for your kind gift of the shed. it could not have come at a better time. It provides the extra storage my family needs during the rebuilding of our home. I just want to let you know where one of your buildings has wound up. My family lives in Waveland, MS. we are just under a mile from the beach and approximately 25 feet above sea level and our home took 5 feet of water. I am married and have 4 children and we are expecting our 5th child in June. Dave, if you see Omar Smoker around, please say Hello for me. Blessing to you and your family. I wanted to tell you again how much I love my new shed! Thanks for the prompt service and understanding when working with my timeline on the fence installation. Shawn was a pleasure to work with on the delivery and up for the challenge of getting it positioned in just the right spot! I don’t know if you remember but the person I had lined up to move my old shed out of the way didn’t get it moved, making Shawn’s job much more difficult. Thanks again! 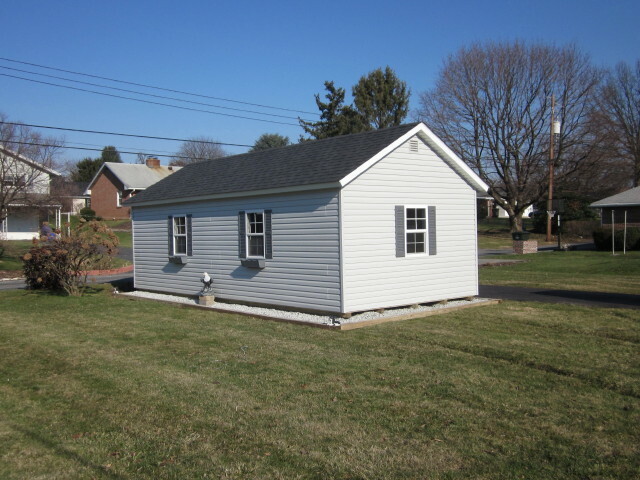 Just wanted to 'thank you' again for the shed and to say that we really appreciate your help in locating this used shed at such a reasonable cost to us. It should serve their purposes very well. Like I said to you the other day, we are 'very' pleased with 'our' 'Twin Locust shed and will not hesitate to refer customers to you whenever possible. Your service and product are top notch! Thank you! Sam did a great job w/ the shed drop off. Looks great on the site. I wanted to tell you that I am very pleased with the garage. It's a good value and the quality exeeded my expectations. I will recommend you to others. Thanks. Thank you so much for the wonderful job you did building the shed! We love it! The entire Twin Locust Staff was great to deal with! Thanks again. A Merry Xmas + a Happy New Year to you and your family and employees and thanks for your help and support on our garage. We are very pleased and proud of the garage. Don't mean to hold you up with this letter, saw one of your buildings that you did for Joe Timney and was very impressed with the workmanship and cost. He showed me your pamphlets, but did not have any extras, could you please mail me the literature. Enclosed are a couple of stamps for postage on your material. Thank you.